Google and Motorola Mobility make beautiful smartphones together. 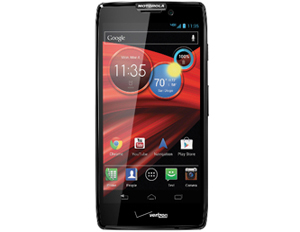 Earlier this fall they introduced their first collaborative models: the Motorola Droid Razr HD and Droid Razr Maxx HD. Both phones boast large displays in slim profiles. And, unless you look very carefully, they appear to be exactly alike. Available now through Verizon Wireless, the Droid Razr HD runs for $199 and the Razr Maxx HD costs $299. What’s behind the $100 difference? Well, the Droid Razr HD is impressively thin and light and almost the same size as the original Droid Razr, but has a smaller screen. The Razr HD is just 0.33 inches thin and measures 5.2-by-2.7 inches overall. Thanks to a thin bezel, it doesn’t come off as a big phone. At only 5.5 ounces, you’ll barely feel the device in your pants or jacket pocket. The Razr HD sports a beautiful 4.7-inch, 1280-by-720 Super AMOLED display that offers bright, rich colors, deep blacks and wide viewing angles. Performance-wise, the phone is quite speedy thanks to a dual-core Snapdragon processor. Verizon’s 4G LTE network also helps, allowing users to download apps, web pages, and files at up to 20 megabits per second (Mbps ). Call quality is excellent on both ends. The 16GB of internal memory can be expanded via a microSD port that accepts cards up to 32GB. Other specs include a micro High-Definition Multimedia Interface (HDMI) port, Digital Living Network Alliance (DLNA) for wireless display connectivity, Bluetooth 4.0, NFC, GPS, and Wi-Fi. There are only two drawbacks to the Droid Razr HD. The first is the 8-megapixel camera on the rear. It produces decent pictures, but nothing as impressive as the HTC One X, Apple’s iPhone 5, or Nokia Lumia 920. The second is the battery life. It’s possible to make it through a full day on one charge with medium usage. Beyond that you’ll need to employ power-saving tweaks. Luckily, the included SmartActions app can help cut down on battery drain. While SmartActions is useful, those looking for serious longevity should consider the Droid Razr Maxx HD. This Droid model boasts a 3,330mAh battery (compared to 2,530mAh) — though bigger, it doesn’t add much weight or bulk. The Maxx HD is 0.04 inches thicker than its sibling and 0.1 ounces heavier. Unless you put the two side by side and really eyeball the back, you won’t notice the difference. How much extra battery does this give you? In testing, the Maxx HD lasted well over 2 days with medium usage. With very heavy usage–and every radio on–it reached nearly 12 hours. Even people who stay on their phones constantly will find it hard to drain this battery before the day is up. Otherwise, the two phones are identical. Which one should you pick? If you have the budget, go for the Droid Razr Maxx HD. The extra-long battery life is worth the extra cost. And with holiday discounts, you may see it for less in the coming weeks. If your budget is strict (or you don’t need a two day phone), the Droid Razr HD is the next best thing.